Former Middlesbrough and Coventry City striker Noel Whelan is among six players being released by Aberdeen. And goalkeeper David Preece, defender Scott Morrison, midfielder Derek Adams and striker Steven Craig have been put on the transfer list. It has also been confirmed that midfielder Markus Heikkinen is leaving the Dons after rejecting a new deal. Lubomir Blaha, Thorarinn Kristjansson, Markus and Mikko Paatelainen, plus Phil McGuire, are the others being freed. The 30-year-old Whelan signed in August after leaving Derby County but only managed four goals in 23 appearances. Defender McGuire has been a first-team regular since emerging from Aberdeen's youth system but, at 26, is no longer in manager Jimmy Calderwood's plans. 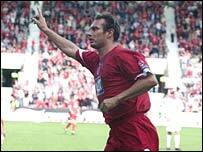 Czech striker Blaha, formerly of Slovan Liberec, failed to impress in his three months at Pittodrie. Striker Kristjansson, previously of Keflavik, and brothers Markus and Mikko Paatelainen, formerly of FC Kooteepee, had arrived in Aberdeen in January but have fallen foul of Calderwood's ruthless cull. Adams and Craig had joined the Dons after turning down new deals at Motherwell last summer but are again looking for a new club. The 20-year-old Morrison is also deemed surplus to requirements after a fall-out with the manager, despite being involved with the Scotland Under-21 side. Preece, like the other three, still hase a year left of his contract, but Calderwood has decided that having the 28-year-old and recent first-choice Ryan Esson on the books was a luxury he could not afford. "I've obviously signed Jamie Langfield on a pre-contract and it was my intention to have three goalies capable of playing in the first team," said the manager. "However, the way the budgets are, I've had to try and free up some money for elsewhere. "There's not a lot between David and Ryan in terms of ability, but David is older and probably has a better chance of picking up a club elsewhere. "That said, all four are still under contract and there is the chance, if they don't find other clubs, they'll be back for pre-season training at the end of next month."